TRH Prince Charles, Prince of Wales visits Hansali Farm to see the work of the Punjab Organic Farming Council on the third day of their four day visit to India on October 4, 2010 in Chandigargh, India. 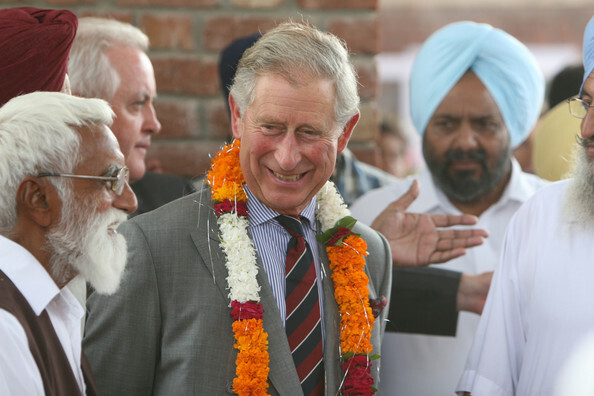 Prince Charles opened the Commonwealth Games on behalf of The Queen on October 3, after which Their Royal Highnesses are undertaking a series of engagements throughout India. Charles is often seen sporting this style of a full width, thick striped diagonal tie. The contrast to the tiny vertical stripes on his button up shirt is a nice touch.